ETP Supplies a number of supplies for boat race committees, whether yacht or small sail boats. These supplies compliment or selection of standard and custom race marks. Race Committee Flags, Race Committee Hats, and complete international signal flags, alphabetical, numbers and others. 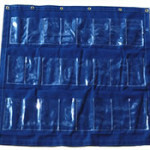 Keep Your Race Committee Flags Organized with our Flag Organizer 24 clear-pouched organizer. This convenient 24 clear-pouched organizer holds your flags where they can be seen for ready use. The addition of grommets allows it to be hung up where it can be accessed easier. It also folds and rolls for easy storage. The organizer has 24 pockets. All pockets are approximately, 8” x 4.25”. Click For Selection of sizes / styles / officer specific flags. numeral flags and signal flags in 3 sizes.